Williams was elevated to the Colts' 53-man roster from the practice squad. 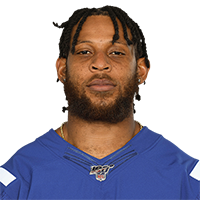 Analysis: Williams joined the Colts' practice squad in early October after being waived by the Saints after three games. The 24-year-old should serve as a depth back with Marlon Mack, Nyheim Hines and Jordan Wilkins all currently healthy. Williams signed with Indianapolis' practice squad Tuesday. Analysis: Williams was previously cut by the Saints after failing to make an impact in the team's backfield, and now joins the practice squad of a Colts team in real need of help at the running back position. If Williams is able to impress, the opportunity exists for him to potentially carve out a depth role. Williams was waived by the Saints on Friday, Ian Rapoport of NFL Network reports. Analysis: Williams had some hype during the preseason as a potential replacement for Mark Ingram (suspension) throughout September. The Saints ultimately have relied on a heavy dose of Alvin Kamara, with Mike Gillislee getting 14 carries and only three going to Williams. The Saints will use Dwayne Washington as their No. 3 running back for the final game before Ingram returns. Williams gained one yard on one carry in Sunday's win against the Falcons. He also caught his only target, which also went for just one yard. Analysis: Williams was nearly invisible against the Falcons, playing a mere nine offensive snaps. While he actually saw more playing time than Mike Gillislee, who played just four snaps and gained 10 yards on three carries, neither backup running back is a particularly appealing option with Mark Ingram set to return from suspension in Week 5. As such, Williams probably does not need to be owned in most fantasy leagues. 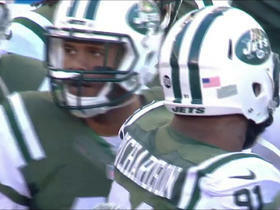 Williams lost a yard in his only carry of Sunday's 21-18 win over Cleveland. Analysis: Neither of the Saints' first two games -- a shootout followed by a late double-digit deficit -- has been conducive to running the football. Even by that low standard, though, two carries and a loss of a yard over two weeks is not promising -- especially compared to Alvin Kamara's 36 total touches and Mike Gillislee's 11. Things are unlikely to improve in two weeks when Mark Ingram (suspension) is able to return to the stable. Williams did not gain a yard on his only carry in Sunday's loss to the Buccaneers. Analysis: Promoted to the active roster before the game, Williams played behind both Alvin Kamara and Mike Gillislee in his Saints debut. However, wIth Gillislee falling flat, including losing a key first-half fumble, the door to playing time during Mark Ingram's four-game suspension may have opened a crack for Williams. The former Arkansas product will nevertheless be hard to trust for fantasy purposes Week 2 against the Browns. Williams is being promoted from the Saints' practice squad to active roster Saturday, Joel A. Erickson of The New Orleans Advocate reports. Analysis: Despite the decision to waive Williams just last Saturday, New Orleans appears to have found a role for the 24-year-old on its 53-man roster. It seems plausible that Williams will factor into the backfield rotation while Mark Ingram serves his four-game suspension, but he'll be a long shot for fantasy value behind Alvin Kamara and Mike Gillislee. Williams has signed to the Saints' practice squad, Mike Triplett of ESPN.com reports. Analysis: Although the back failed to secure a spot on the 53-man roster, he won't be going far. Mark Ingram will begin his four-game suspension this week, so if the Saints suffer any injuries in the backfield, Williams could be back on the active roster. The Saints waived Williams on Saturday, Nick Underhill of The New Orleans Advocate reports. Analysis: When Mark Ingram's four-game suspension was announced in early May, Williams was perhaps the leading candidate to serve as the handcuff to Alvin Kamara to start the season. As the preseason wore on, though, Williams was surpassed by rookie Boston Scott, who ultimately won the competition. There's a chance the Saints keep Williams around on the practice squad, but he'll first have to pass through waivers unclaimed. Williams took 16 carries for 64 yards and a touchdown, with one catch for seven yards on his only target in Thursday's preseason finale against the Rams. Williams lost three yards on three carries in Saturday's preseason contest against the Chargers. Analysis: The momentum that Williams has been building up over the past few weeks hit a bit of a wall on Saturday night. In addition to his negative yardage output, Williams also got stuffed on a two-point conversion try. Nevertheless, Williams should still be considered the favorite to serve as the Saints' No. 2 running back behind starter Alvin Kamara during Mark Ingram's four-game suspension to start the season. Williams gained 37 yards on eight carries and lost two yards on one reception in Friday's 20-15 preseason loss to the Cardinals. Williams rushed four times for 26 yards and a touchdown during Thursday's 24-20 win over the Jaguars in the preseason opener. Analysis: Williams' first carry didn't come until about five minutes remained in the game, but he certainly made a strong impact nonetheless. In fact, Williams' output all came on one drive, which he capped with a four-yard, go-ahead touchdown. That enabled the Saints to take a couple of knees on their final series, and his solid performance could earn Williams earlier action in next Friday's exhibition against the Cardinals. With Mark Ingram likely facing a four-game suspension, Williams may be in line for an expanded early season role. Williams (coach's decision) is inactive for Sunday's game against the Rams, Herbie Teope of The New Orleans Times-Picayune reports. Analysis: Williams joined the Saints a little under two weeks ago after Daniel Lasco (neck) was moved to injured reserve, but the former Arkansas standout has yet to make his New Orleans debut. That's unlikely to change anytime soon unless one of the three running backs ahead of Williams on the depth chart -- Mark Ingram, Alvin Kamara and Trey Edmunds -- suffers an injury. The Saints signed Williams off the Broncos' practice squad Tuesday, Ian Rapoport of NFL Network reports. 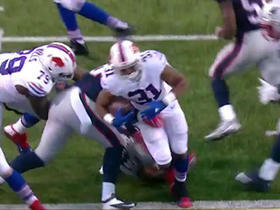 Buffalo Bills running back Jonathan Williams fumbles, recovered by New York Jets defensive end Sheldon Richardson. 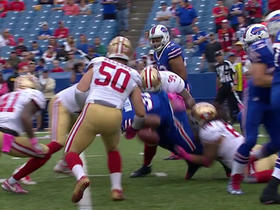 San Francisco 49ers force and recover Buffalo Bills fumble.